Whether you enjoy running, working up a sweat in the gym or taking part in some gentle pilates practice, leggings and running tights are a fitness fanatic’s friends. They’re more practical than jogging bottoms, more stylish than shorts and can transition seamlessly from the yoga studio to the road. Sports brands and fashion brands are clearly realising just how much we love these comfy, thigh-hugging practi-pants because they’re designing them in all kinds of patterns, colours and fabrics. But don’t worry, although there’s a hell of a lot to choose from out there, we’ve collected together our 12 favourite pairs. We’ve got fabric specially built to handle your sweat, bold, high-fashion patterns worthy of a catwalk and even pairs emblazoned with neon flashes of colour and a Disney princess montage. We’re a little bit obsessed with new fashion and fitness website Fashercise, which stocks a bunch of stylish activewear. We particularly love the ranges from Been by D’Heygere, which feature psychedelic juicy green watermelons, piles of mussels and quite literally, all of the pineapples. However, if we MUST pick we’d go with these ‘Mussels from Brussels’ leggings (pictured above), because they can be paired with equally loud tops to keep you looking fashionable and fabulous while you’re working out, or they can be calmed down a little with a black tee or just a plain sports bra. They have a thick elasticated waistband as well as a zipper up the back, so although they’re comfortable and bend about with you they’re not going anywhere. The question is do you dare pair the watermelon oversized tee with the mussels from Brussels leggings like the daring fitness model above? Available from Fashercise for £85. Now Black Milk clothing isn’t designed specifically with fashion in mind like many of the brands featured on our list, but that doesn’t mean they’ve not taken the sporting world by storm. The brand’s loud, unusual and, let’s face it, fabulously ridiculous clothing is popular among fashionistas and gym bunnies alike because they make fitness so much more fun and are such a far cry from stereotypical workout attire – we’re thinking a baggy grey tee and old gym shorts. Ew. As far as leggings go, these Disney princess ones are pretty insane, but they’re so much fun and are bound to turn heads. Available from Black Milk for $85 AUD (they come from Australia, but you can have them delivered globally). Another Fashercise designer joins the list, this time it’s a pair of leggings from Lexie Sport. According to the Fashercise team, the Lexie ‘Blonde’ range was inspired by the patterns blonde hair makes when it moves and swirls around. Hmm. We kinda can’t, but that doesn’t stop us from loving the pattern, which actually reminds us much more of a kaleidoscope! They’re just unusual enough to give your workout gear a kick of style, but they can be dressed down with a simple tee throughout the day too if you’re looking to get a bit more wear for your money. Available from Fashercise for £65. Yeah we know, this second pair from Black Milk still isn’t officially built with fitness in mind, but the blue to green ombre and tree silhouettes are mesmerising and will ensure your workout matches up to just how awesome your legs look in these! Available from Black Milk for $75 AUD (they come from Australia, but you can have them delivered globally). 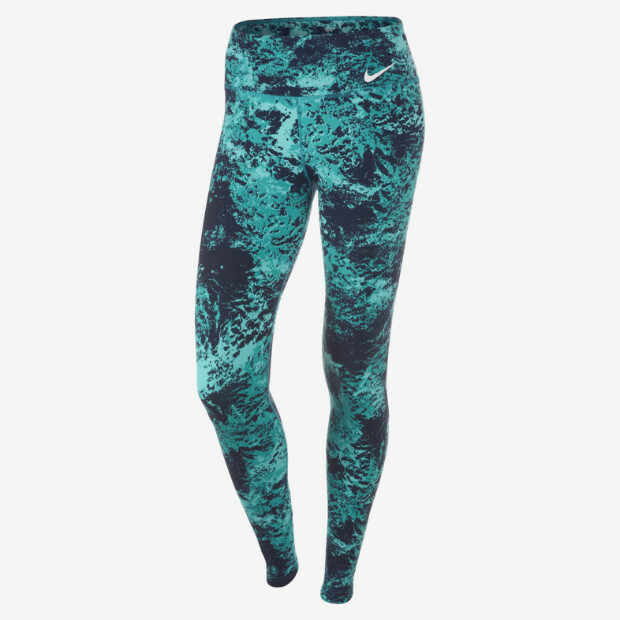 These leggings from Nike aren’t as built for sport as the ones a little further down on the list, but they’re great for some fitness wear and some leisure wear, so ideal if you’re just getting into a fitness routine and feel a bit apprehensive about splashing the cash. They’re got the Nike slogan emblazoned down the edge, but they’re fairly subtle if you’re after something that’s a little less dramatic than the bold prints at the beginning of our rundown! Available from ASOS for £30. If you need your leggings to be able to take some serious sweat, pressure and friction then look no further than Nike’s Legendary running tight. These tights are really popular because they feel just a little bit more silky and luxurious than regular sportswear and they’re a flattering fit for all sizes. Speaking of all sizes, you may think a loud print would draw your eye to bigger legs making some runners more elf conscious, but I’ve actually found that prints with a mixture of light and dark patterns like this are really flattering on legs of all shapes and sizes. Handily the Legendary tights also have a small pocket for essentials if you’re running without a bag and the fabric is also Dri-FIT jersey so if you sweat a lot, have a long distance to run or may get caught in the rain you won’t feel too soggy or weighed down by these either. Available from Nike.com for £65. If you haven’t got much money to spend on your workout gear but need something practical and versatile, then head on over to ASOS and get your hands on a pair of their soft touch leggings in either black or grey. They’ll do for the odd run (although won’t be able to handle buckets of sweat) and they’re ideal for yoga or transitioning from working out to chilling out. They’re soft, comfy and have a thick, elasticated waistband so keep them in place. If you end up getting into a routine, invest in something built for sports, but until then these will do as you experiment. Available from ASOS for £15. If the loud prints we’ve given you so far have had you cringing in your seat, then take a look at Nike’s Epic Lux Printed leggings. They may still come in a range of bold colours, but they’re a little bit easier on the eye, which is great if you’re a little self conscious about working out in the first place, or if you just prefer more muted shades. Just like the Legendary pair, they’re made from Dri-FIT fabric, ensuring you won’t be caught on feeling miserable in the rain. They’ve got a huge, wide waistband, which is ideal for those who find workout gear to be a bit restrictive at times and they also have a secret pocket in the back for important bits and pieces. Available from Nike.com for £70. To check our part three of our leggings round-up with styles from Lululemon and Sweaty Betty: 12 Sports leggings & running tights to keep you comfy, active & stylish [part three]: Lululemon & Sweaty Betty. Both the Wunder Under Pant and Crop are super popular Lululemon workout pants, ideal for trips to the gym, running and especially yoga practice. Both styles are made from the brand’s ‘four-way stretch’ Luon fabric, which feels soft, comfortable and kinda like a second skin. This is ideal for those sick of wearing tight and itchy workout gear who are after something a little more luxurious. The Wunder Under range is so popular the Lululemon community ran a challenge to see how well yoga bunnies can transition from their workout gear in the studio to their regular day-to-day clothes. Check out the Wunder Under Challenge if you’re interested to see how they did! It’s certainly a great testament to how versatile the Wunder Under range is in real life. Available from Lululemon for £72. The Zero Gravity tights are Sweaty Betty’s top running bottoms. They’re made of a sculpted fabric that keeps everything tight while you run, but they’re also high-stretch, soft and really lightweight, so don’t feel too much like armour! Like many of the other tights on the list these have a hidden pocket in the back and reflective strips all the way round. We like that the pattern is unusual but not too OTT. Available from Sweaty Betty for £85. These capri pants from Sweaty Betty are built for gymnastics and yoga bunnies, but will see you through most workouts unless you’re a long distance runner. They come in a loud, neon print that’s reversible on each side and a drawstring to keep them up round the waist. Watch out though, many customers are leaving great reviews for the capris on the Sweat Betty website but say the sizes come up a little bit tight. Available from Sweaty Betty for £75.